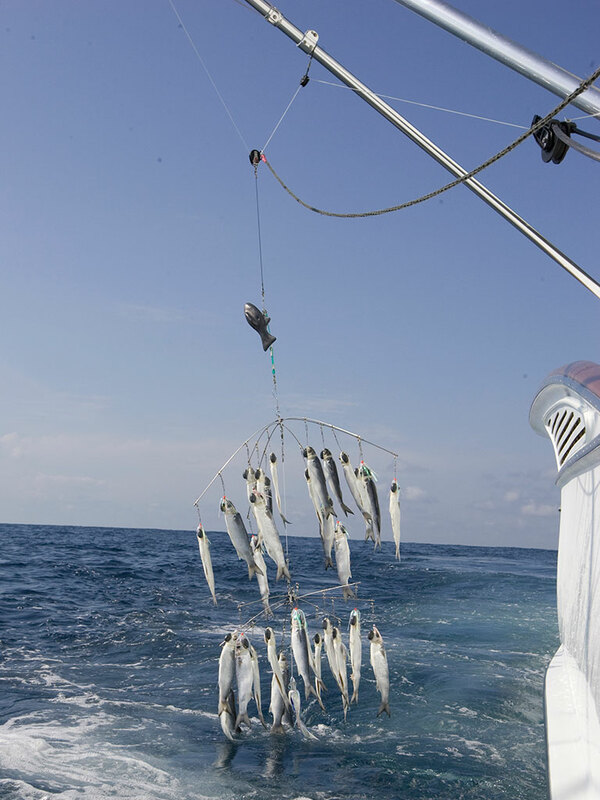 Let’s be realistic: Loading up a double- or triple-tier dredge full of mullet or ballyhoo and tossing it over the side is something that just about anyone can do. But using a dredge to their most effective advantage is something altogether different. In this article we’ll cover three of the basic principles of dredge fishing–set up, retrieval and bait–and we’ll also interview some dredge pros along the way. So let’s put ’em out! The first thing to consider is how you’re going to retrieve your dredges and where you’re going to put those reels. Another is the experience level of your crew. Captain Glenn Cameron from the Flo Rider has been dredge fishing for close to 20 years.  he says. Each of his teaser reels is loaded with 300lb Momoi Xtra-Hard mono.  says Fields. The automatic stop when retrieving the dredge allows my deckhands to just push a button and immediately focus on another task.  He adds, We use the Lindgren Pitman S-1200 reels and they are powerful and well built. The interchangeable spool is also a great feature when you want to switch your gear over to bottom fishing: it’s quick and easy.  says Fields. His dredge teasers are loaded with 400lb Momoi Xtra-Hard mono.  he reports. Having the quad electric reels in the bridge worked out alright for slow trolling for sailfish but it can be overwhelming when running all your teasers and marlin fishing. I found it to be challenging in locations like St. Thomas where you have to drive the boat and hand pull teaser chains and lures. With the ’Auto Stop’ feature on the electric reels, it really is the greatest invention for dredge teasers. On our new boat, the cockpit will be equipped with the LP S-1200 electric reels for our dredges.  Wheeler also points out that regardless of your electric bridge teasers, it’s important to have access to the teaser line if you plan on pulling chains or teaser lures so you can easily pull on it beneath the hard top. Regardless of how you troll dredges, you will need to design a basic block and tackle system to leverage the power of your teaser reels and decrease the drag force of retrieval (see diagram for a popular set-up). ¾ inches for those using large dredges or running at high speeds in rough conditions. In addition to running a block and tackle, Capt. John Lagrone of the Los Suenos-based Xta-Sea explains, The pulley placement with your dredge teasers needs to be positioned as low as possible on your outrigger so your angler’s rods will be able to clear the dredge teaser line when the boat is in a turn and you’re going for multiple fish. 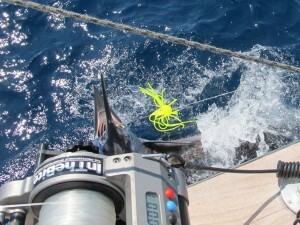 The angler hooked up first needs to automatically go to the aft inside corner of the cockpit to play the fish and keep the line above the dredge teaser. Wheeler also points out that with hands-free cockpit dredges, the auto stop feature allows the mates time pull down teaser lines so the angler can get a bait close to a teasing fish and also pull down teaser lines so the angler’s line can clear it when hooked up and in a turn. Ever wonder how far back other captains are pulling their dredges? Plenty of variables such as rigger size and angle, boat speed, amount of whitewater and dredge weight all factor into how deep a captain pulls his dredge. Glenn Cameron explains, The most important factor for me is the dredge needs to be trolled completely submerged with no skipping or tumbling. I also like to fish it where I can see it and see fish around it. If I had to pick a general spot where I like the dredge, it would be somewhere between the first and second wave. Wheeler is similar to Cameron in placing his dredges are far back as he can and still just barely see a fish following it. This is where a tower guy comes in. To use dredges effectively, especially in tournament situations, it’s incredibly helpful to have another set of eyes high up in the tower if conditions are accommodating (and your boat is equipped with a tower). Alan Fields also makes it a point to place a flat line bait just over and a few feet behind the dredge. You want a bait to be seen if a fish is trailing the dredge. If the fish looks up, you want it to see a bait. 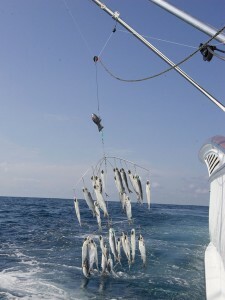 You don’t want to have a bait too far behind the dredge where the fish could fade back or away. Give them something easy to see. And eat. Once you are hooked up with a small billfish like a sailfish or white marlin, it’s no secret the best teams in the circuit have a knack for going after multiples. In a tournament situation, you can hardly compete if you are just picking off singles: it’s mandatory these days to add doubles, triples and quads. So what’s best way to do this with the dredges? Surprisingly, many captains differ on how and when to retrieve their dredges. Glenn Cameron says, I like to make my turn once we have a fish hooked up and then simultaneously retrieve my outside dredge and inside daisy chain to the boat. I then draw my inside dredge up a little into the clear water and leave my outside daisy chain to troll behind the dredge as I continue to make a turn. My goal is to engage any other fish that may be swimming with the one we are hooked up to. Leaving a dredge and daisy chain in position closest to the fish is standard procedure on my boat. Once I get near the first fish or hooked up to multiples I’ll then begin the process of retrieving my dredge and teasers. Another thing we normally do is to leave the dredges hanging and only bring them in the boat for maintenance. Wheeler advocates leaving his dredges out as long as possible before retrieving them. When I do retrieve them, I generally will pull the inside dredge in first to get it out the way and then retrieve the inside teaser chain. As long as it’s not getting tangled or interfering with the fish I like to leave them out. That also goes for the baited lines, keep fishing as long as you can but stay organized. Depending on your targeted species, your dredge baits may differ from faster trolled artificials to slower trolled natural baits. It’s also not uncommon for crews to pull one side using natural baits and on the other side with artificials. When tournament fishing though, most teams will rig their dredges using all natural baits, with the most common being mullet on one side and ballyhoo on the other. 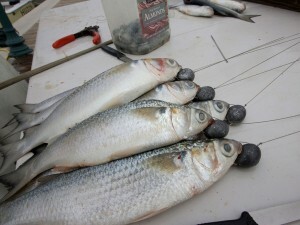 It’s also not uncommon to see a mixture of baits such as a mullet dredge with a ballyhoo chain down the center.  he says. It just won’t swim right. The dredge teaser is by far one of the most productive teasers of modern sportfishing but the key is to find a setup that works best for you. Years ago, dredge fishing was primarily used for just for sailfishing but as tournaments expand release categories and payouts, dredges are finding their way onto more decks in the Gulf, the Bahamas and the Caribbean. If you are reluctant or new to dredge fishing, we recommend keeping it simple, taking some time to experiment and most importantly, making sure you have the correct gear and boat set-up. The payoff can be tremendous! 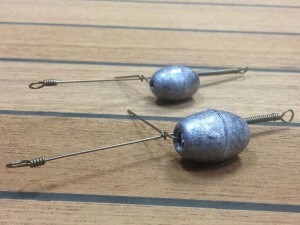 Several retailers sell plenty of dredge accessories including pre-made pin rigs which come in several different weights and sizes. This can be a big time-saver when it comes to rigging dredge baits; with the pin rigs, two experienced mates should be able to rig 100 dredge mullet in an hour. When using double dredges on each side, a boat can quickly use over a 150 mullet per day so plan accordingly. Three-ounce leads are the most common size for dredge mullet. Always double-check your line-to-dredge teaser connection; you don’t want it to disappear into the deep blue. Let your dredges hang in the riggers when retrieved, they take up lots of room on your deck and will get stepped on and/or tangled up. If seaweed is present, plan on clearing the dredge frequently as they are like a rake in the ocean. Always have a back up: Murphy’s Law prevails. A popular electric dredge reel setup consists of two L-P S-1200s in the cockpit loaded with 400lb mono and two Super 9 Miya Epochs on the bridge loaded with 250-300lb mono.